A group of Chinese villagers who had gone to court in the Netherlands in their battle to prove they are the rightful owners of a golden Buddha have been told by the judge their case is inadmissable. The court said that the committees from the villages of Tangchun and Dong Pu are not legal entities and so cannot take legal proceedings. 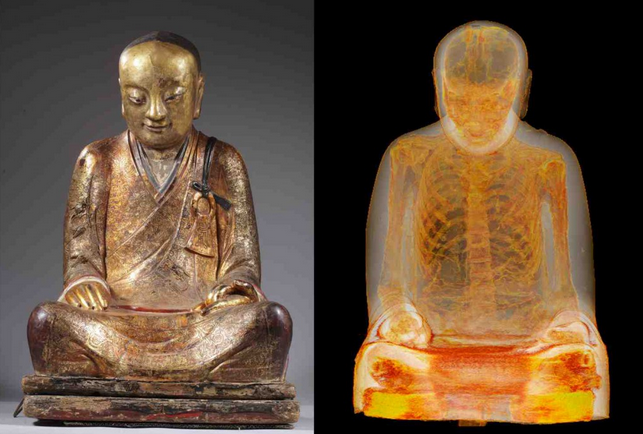 The court did not rule on the ownership of the Buddha, which which contains the mummified body of a monk. The villagers say the 1.2 metre high Buddha was stolen from them 22 years ago. Oscar van Overeem, said to be the owner of the statue, told the court earlier this year that he no longer owns it and that he does not know the identity of its new owner. Van Overeem told the court he had swapped the Buddha with another collector in a paper-free deal because he was ‘fed up’ with the legal wrangles surrounding it. Questions about the 1,000 year old Buddha’s ownership arose when it was the star item in a show at the Hungarian natural history museum in Budapest in 2015. Pictures of the Buddha were shown on a Chinese news programme, leading villagers in Yangchun to claim it had been stolen from their temple in 1995. The statue contains the mummified body of a monk, who the villagers claim is local man Zhanggong Zushi. But Van Overeem disputes their claim, saying the Buddha he owned did not have a hole on its left hand or signs of a break on the neck.